Hot off his official signing with Strange Music, Rittz is wasting no time as he prepares to hit the road with Yelawolf for the official Slumerican Tour. 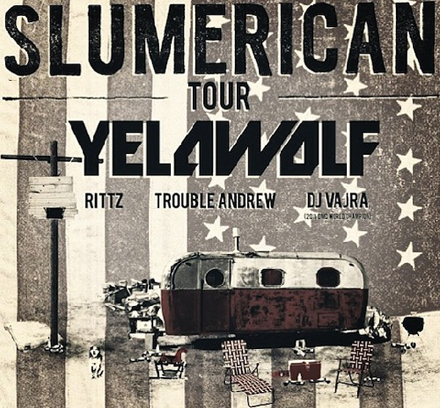 The Slumerican Tour, which also features Trouble Andrew and DJ Vajra, will see Rittz once again team up with his mentor, Yelawolf, for a 54-city trek that will hit major spots like Chicago, Atlanta, Philadelphia, and Los Angeles. Don’t miss out on seeing favorites like “High Five” live and see why Rittz’s intricate performance was enough to earn him a spot on Tech N9ne’s team. Slumerican is not a trend, it’s a lifestyle, so show your pride and represent in your city! CLICK HERE TO PURCHASE TICKETS FOR THE SLUMERICAN TOUR FEATURING RITTZ. Which date will you be hitting?